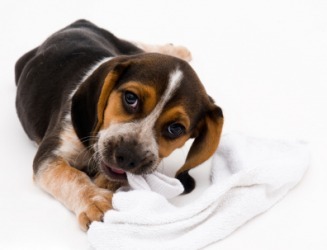 A puppy chewing on a sock. The definition of chew means to use teeth to bite, cut through and grind into smaller pieces, or is slang meaning to reprimand someone. An example of chew is using your teeth to turn large pieces of lettuce into smaller, easier to swallow pieces. To tell someone off is an example of how to chew someone out. "chew." YourDictionary, n.d. Web. 20 April 2019. <https://www.yourdictionary.com/CHEW>. To bite and grind with the teeth; masticate. To meditate on; ponder: chew a problem over. To make a crushing and grinding motion with the teeth. To cogitate; meditate: chewed on the difficulties ahead. Informal To chew tobacco as a habit. Something held in the mouth and chewed, especially a plug of tobacco. Phrasal Verbs: chew out Slang To reprimand; scold. Make sure to chew thoroughly, and don't talk with your mouth full! The steak was tough to chew as it had been cooked too long. To grind, tear, or otherwise degrade or demolish something with teeth or as with teeth. He keep his feed in steel drums to prevent the mice from chewing holes in the feed-sacks. The harsh desert wind and sand had chewed the stump into ragged strips of wood. (informal) To think about something; to ponder; to chew over. The professor stood at the blackboard, chalk in hand, and chewed the question the student had asked. A small sweet, such as a taffy, that is eaten by chewing. Phillip purchased a bag of licorice chews at the drugstore. The school had banned chew and smokes from the school grounds, even for adults. (countable or uncountable) A plug or wad of chewing tobacco; chaw or a chaw. The ballplayers sat on the bench watching the rain, glumly working their chews. The first time he chewed tobacco, he swallowed his chew and got extremely sick. Middle English chewen, from Old English ċēowan, from Proto-Germanic *kewwaną, from Proto-Indo-European *ǵyewh₁- (compare Latin gingīva (“gums”), Tocharian B śuwaṃ (“to eat”), Polish żuję (“I chew”), Persian جویدن (ǰavīdan), Pashto [script?] (žovạl, “to bite, gnaw”)). Did you chew her out in front of everyone? Might try to chew through my other arm. Given more time, he'd have preferred to put the bike on the car's rack and chew up some countryside miles, tour­ing the hills and farm lands that surrounded Parkside. The natives chew betel nuts instead of tobacco, and to the production of these nuts they devote more than 60,000 acres. He then studied law in the office in Philadelphia of Benjamin Chew, and was admitted to the bar in 1761.